ChinAfrica: What are your thoughts on the development of the long-standing bilateral relationship after the establishment of diplomatic relations? Mbelwa Kairuki: China and Tanzania have been best friends for the last 55 years. Tanzania was one of the first countries to support the one-China policy and we played a role to ensure that China got back its rightful seat at the United Nations. China has also been supporting us in many areas. In the liberation struggle, Tanzania was at the epicenter of liberation and China played an important role in supporting our efforts to help our brothers from Southern Africa to gain their independence. Apart from that, China has supported us on the economic front, with projects like the Tanzania-Zambia Railway which provided access to the sea for our brothers in Zambia. In addition, a variety of economic projects were implemented in the 1970s and 1980s [with China's assistance]. Fast forward [to more recent times] when we now have the Forum on China-Africa Cooperation (FOCAC). We have an economic and commercial bilateral framework agreement with China and we are satisfied with it. Going forward, we see China complementing our efforts to attain our Development Vision 2025 to reach the status of a middle-income country. To achieve this, we have set ourselves a five-year development plan. Right now we are implementing Development Plan 2015-20, which focuses on industrialization. Today Tanzania is among the main recipients of various initiatives by China through the FOCAC. We are among the pilot countries for production capacity cooperation, where we are seeing industries relocating from China to Tanzania, as well as seeing increased investment. While there are increasing volumes of trade between our two countries, there is still room for improvement. In which sector do you think the China-Tanzania cooperation could be further strengthened? One area is in the social sector, and education in particular. There is a saying that somebody can either give you fish or teach you how to fish. I think we should learn from China's experience on how they overcome the struggles toward attaining economic independence, so we must build the capacity of Tanzanians. We need to train more agricultural experts because 69 percent of Tanzanians are engaged in agriculture; but still, our agriculture is very rudimentary, being dependent on manual labor and rainfall. A lot of people in poverty are in rural areas and we cannot lift people out of poverty if we are not addressing issues of agriculture. China has made great strides in this area. We need to bring more [Tanzanian] people to China for training and also welcome Chinese experts to Tanzania [for transfer of skills]. In addition we need to establish cooperation between research institutions. Another area besides agriculture is engineering. Our country has a lot of projects that need to be carried out. We must build a lot of roads, railway [lines] and ports. There are two ways for this to happen: In the short term, we can get Chinese loans and Chinese contractors to come and work for us; but in the long term, we want to build our own capacity to be able to do these things ourselves. We can't be depending on an outside country to do this for us for a century to come. So we need to start training our own experts in engineering, and in different aspects, so that they may be able to implement these projects. Lastly, the issue of health institutions. Health is an area where China has made great strides and we wish to learn from them and train our doctors. It is disheartening to see [in Tanzania] that you'd go to a hospital and there is only one cardiologist in the entire region or perhaps no cardiologist at all. A lot of people die and we often say it's God's will; but most of the deaths are not God's will, it's just that we don't have the experts. We need to train more health experts so that we may avoid people dying from curable diseases. At the FOCAC Beijing Summit last September, the Chinese Government pledged eight major initiatives to promote China-Africa cooperation. In terms of Tanzania, which initiative or initiatives are the most important? Well, they are all important, but again we have to be reasonable. These eight initiatives are for all 54 countries, so we have to prioritize which areas we need to focus on. For us, it's infrastructure, including construction resources and capacity building. We need to make full use of the 50,000 training opportunities that have been offered during the FOCAC Beijing Summit. Again, I will refer to the issue of health. 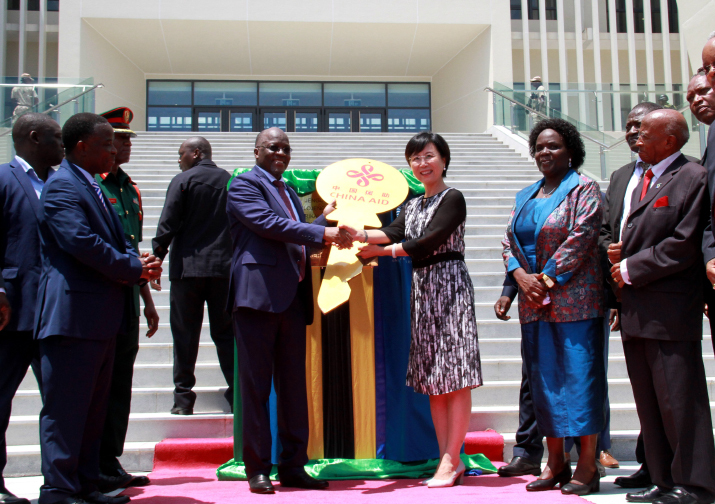 With the help of China, we have constructed a cardiac institute in Tanzania. Tanzania and China have agreed to expand the institute to the center of excellence for East and Central Africa. Our desire is to see that we send no patient outside the country for cardiac treatment. We are very grateful to the Chinese authorities that have put us in touch with Fuwai Hospital in Beijing, one of the best hospitals for cardiovascular diseases treatment in China, which is the caretaker for our [cardiac] institute in Tanzania, and they are also working with our team to design this new [center-of-excellence] project which will not only serve Tanzanians, but also people from neighboring countries. So these are the areas we need to focus on. What are your impressions of the two sessions of the National People's Congress (NPC) and the National Committee of the Chinese People's Political Consultative Conference (CPPCC) that took place last month in Beijing? I had the privilege of attending the opening [of the NPC session on March 5]. I was impressed by the continuity conveyed by political events every year, [especially] the continuity of the policies taken by the Chinese Government. Throughout the two sessions this year, the key message was people-centered. These were issues of concern to people, such as poverty, prosperity and pollution. It was also about looking forward with things like innovation, research and development, big data, artificial intelligence and 5G technologies. The speech by the Chinese Premier [Li Keqiang] was related to the aspirations of the population and was intended to improve people's lives. The policy of the Communist Party of China is to improve the people's wellbeing. In terms of poverty alleviation, in 2017, the Chinese Government's target was to reduce poverty by 10 million people. In 2018 and 2019, it was the same target. The most important thing is that those targets of the past years have been reached. A lot of governments set targets for themselves, but achieving them is something else. The targeted measures China has taken to reduce poverty have been quite successful at all levels and it is the cornerstone of government.